I am a three-bun wig, brown-booted, very large, maternal bosom sort of a gal. David Ashley is talking about his pantomime alter ego which has inhabited him over the Christmas period for 12 seasons. David’s successful West End career and occasional teaching saw a change of emphasis as he hit his forties with teaching taking over – ArtsEd, London College of Music and The Royal Central School of Speech and Drama – with a binge of stage work every December. He is currently playing Nurse Nelly in Snow White at the Wyvern Theatre in Swindon which, incidentally, is where it all started. It was Jack and the Beanstalk at the Wyvern Theatre, Swindon in 1986 – my first job! It all came about after a chance meeting with a woman who changed my life: Mollie Tanner. I grew up in the beautiful market town of Cirencester, was a chorister at the Parish Church – where I began my singing and musical training under Father John Beck – and after a family move to just outside Swindon I met Mollie at the Swindon Festival. It was the moment that changed my life and I will always be grateful to Mollie for her drive, patience and belief in me. Just over 6 months later I was making my professional debut at the Wyvern Theatre, getting me my much needed equity card, which lead to my West End debut just over a year later. David was 19 years old when he first appeared in the West End. It was in a show called Ziegfeld at the London Palladium. It was directed and choreographed by the late, great, Joe Layton in 1988. Lordy! That was a while ago! I’ve been so lucky with my career and have been a busy boy. He certainly has. After Ziegfeld he went into Me and My Girl, followed by Starlight Express, Talent, Saucy Jack and the Space Vixens, Party, When Pigs Fly, Cats, Les Misérables, Dirty Blonde and Blood Brothers, between times touring in Cats and Crazy for You, with stints in productions of My Fair Lady, Seven Brides for Seven Brothers, Merrily we Roll Along and Moon Landing. All those months applying his finely blended Cats makeup has given his pantomime slap a glamorous touch. 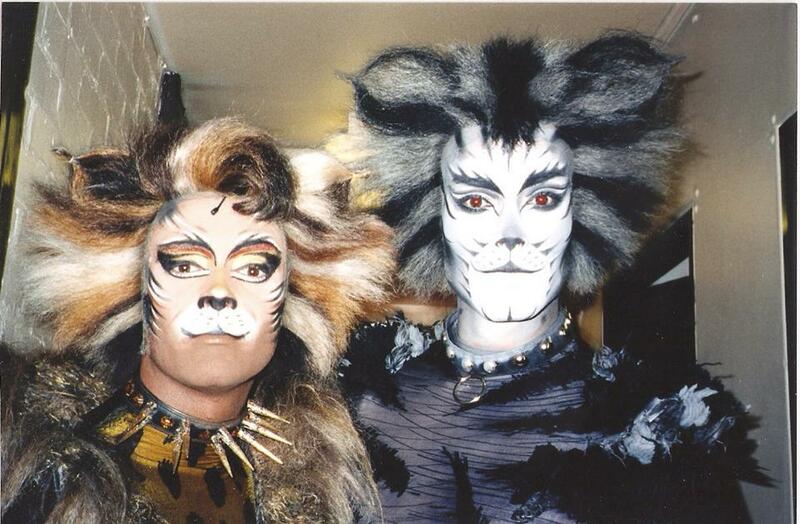 I loved applying the makeup for Cats. It was designed by Karen Dawson Harding who gave a tutorial in application then handed the brushes over to you. Although dauntingly terrible at first, you soon got the hang of the brush ‘press and flick’ technique required. ‘Press and flick’ was a term that I coined for when you draw a line with the brush then simply let the bristles flick out to create a beautiful line. There were many who didn’t want to employ this technique, sadly, and their makeup looked more like a face-plant into their makeup bag… never a good look! To be honest, I wasn’t going to go out on stage looking a mess so I put the time in to get it right. Vanity and the actor! On the escalator on the London Underground or on the side of a double-decker bus, his makeup could be appreciated up close, as he was the Cats poster boy. He played Munkustrap, a silver tabby. The makeup was all blended greys, backs and silvers, with the stripes blended into the wig to connect it all together. It is a beautiful design – as they all are – but the secret was to not apply the makeup as a mask, but to keep your human side there and then blend the two together. 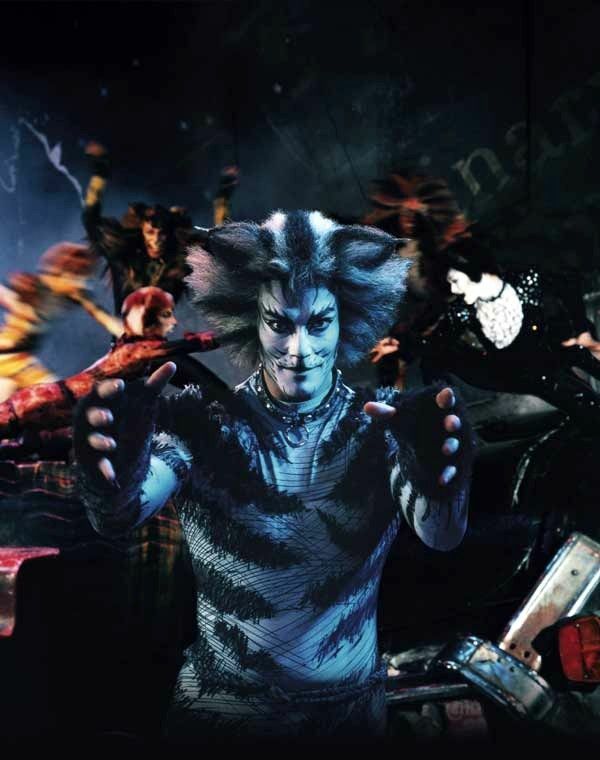 The dancers in Cats sweat… and how… but that beautifully detailed makeup mustn’t run. The problem was solved using Dermablend, which is used for scar and tattoo coverage. It’s thick stuff but really stays on during a sweaty show. Great strong colours too and I wear it for a base colour and any lines needed as dame. 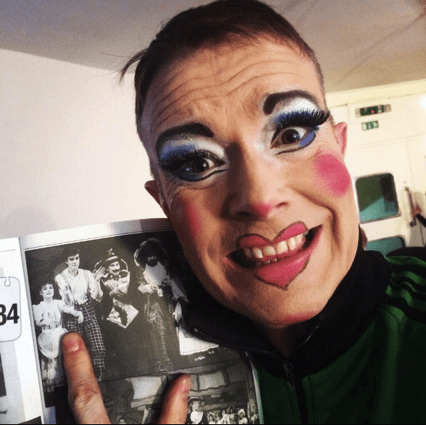 David doesn’t always play a dame in panto and the Cats-effect is even more apparent in his makeup for King Rat or Abanazar. I design and apply my own makeup and it takes about 20-30 minutes depending on the eyelashes wanting to go on… or not! I love the rosy-cheeked, cupid’s bow lipped look that is exaggerated but still a kind face. I apply lots of powder to help keep the makeup on as I get very hot during a show. Clearly glitter plays a big part too! David’s a whopping 6ft 5” (195cm) which, coupled with ‘monster high heels’ for an ugly sister or a tall crown for King Rat, makes for an impressive effect before he even opens his mouth or does a step. However, as an actor, he likes to maintain a truth to his character. There are many different types of dames but I like to play mine as a really gorgeous, kind lady who is a huge romantic, a deep believer in fairness but a little slow on the uptake of some of life’s important details. She is most definitely real for me as a character so although the wigs, makeup and costume are exaggerated and sometimes silly she doesn’t realise that they are… she’s just put on her best frock! As an actor I hope that she will get a laugh on her entrance – and every scene has a new frock, of course! – but I don’t play it for laughs! 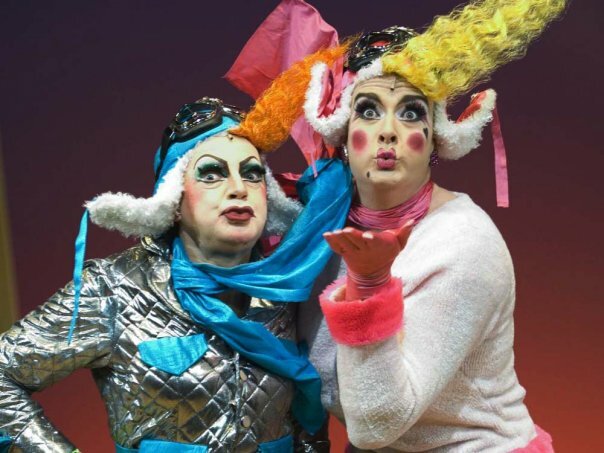 Like Nutcrackers, pantos have double shows, and usually on every performance day. What makes him do it? It’s sanctioned lunacy! A total joy from beginning to end. My favourite part is the audience. The roar of the crowd throughout is thrilling and seeing everyone supporting the characters’ journey is wonderful. If you are telling a good story, the children totally believe in its heart and get so engaged with it all. It’s a wonderful thing to see them getting so involved. 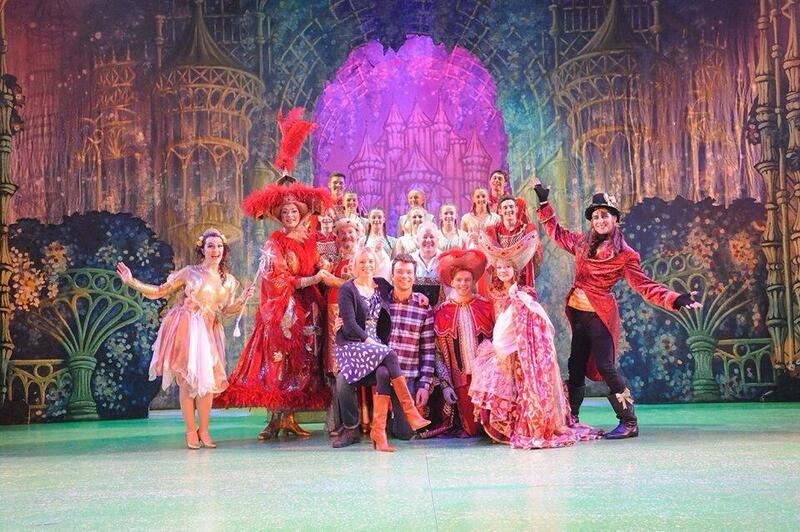 Pantomime is important as it’s sometimes the first time children see something at the theatre. If it’s done right, with truthful storytelling and a huge heart, it’ll get them hooked and keep bringing them back to see more theatre. As a dame, you also get some of the best one-liners. 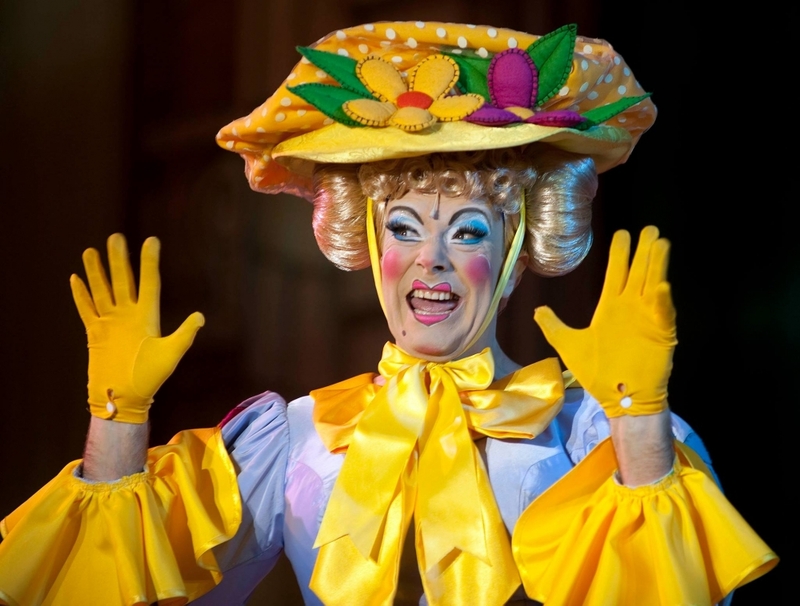 Who wouldn’t want the chance of saying – as David did as an ugly sister in Cinderella at the Hackney Empire – the line, “Ooo, the Prince’s balls get bigger every year!” Great stuff. Of course, you can boo the baddie, and fall in love with the Prince and Princess, but the relationship that the audience has with the dame is special. One of the many joys of playing a dame is breaking the fourth wall and chatting directly to the audience. It can be letting them in on a gag, a set up for something, telling them something juicy about a character or even something about her circumstances and situation. It’s almost like they are in her front room and she’s just having everyone over for a cup of tea and a natter. Now there’s a man you want to spend a weekend with, with a notebook, sharing everything he knows about makeup!! Thank you, Gram!